The Art of Speaking is the Art of Pausing by Eric Stone | Succeed When You Speak! Context and Premise: Very often, good speaking is viewed as a verbal art form. Elocution, diction, and modulation, to only name a few elements, are believed to be the obvious and essential ingredients to a good speech, communication or presentation. With verbal power comes the undeniable importance of skills in the arenas of intentions, staging, presence, experience and message. All these aspects have two dynamics in common: space and time. On a practical level, time is punctuated by silence or pauses. Firing content at an audience or in a one-on-one conversation spells disaster and can be very annoying. The art of speaking is the art of pausing. The silence or pause is an interruption of the sound. Without it, there would either only be sound or nothing at all. Individuals and audiences alike feel, think, and listen during the pause. Ideas are grasped at the pause or during the silence of communication. People who communicate successfully verify at each pause if their message is getting across. They adjust based on what they find at the pause. It is impossible to listen to anything that contains no pause or silence. It is so obvious one could not even put it to the test. Pauses are the oxygen of all verbal communications, from one-on-one chitchat to full-scale great speeches or performances. Pausing, therefore, is the art of creating silence so people can understand the meaning of what you are doing and saying. In my view, it is essential to understand pausing as the ultimate technique to get your messages and ideas across. In addition, people cannot hear you when you speak but only when you stop speaking; it is the “interruption that creates the possibility of understanding.” I find that assertion very amusing because most people want to become better speakers. Well, if you become a better “pauser”, you’ll be a better speaker. The two are intimately connected. All pauses are pregnant with content. You can intimidate with pauses, or you can impact tactfully with them. It is more than a craft. Watch people who pause a lot and, consequently, hold your attention. It is because they pause intentionally. The truth of any relationship is lodged in the silence between two people. What takes place in the silence is incredibly revealing. When you send e-mail to someone, and they do not write back after they receive it, it creates “communication in the silence.” More is said in the silence or subtext in communication situations than in the speaking. The speaking shines as a consequence of the pauses; therefore, the art of pause is the true engine behind all successful communications. Silence is a controlling mechanism, but when used properly, it will command anyone’s attention within moments. We’ve all been in situations where we are being stared down or sized up. I’d like to bring to your attention that it feels doubly awkward when nothing is said during those friendly controlling “procedures.” That’s what makes them difficult to bear. How do I practice the art of pause? By listening actively at every pause you intentionally make. One listens, sustains, and contemplates at pauses. One listens to: impact, mood, thoughts, feelings, adjustments to be made, etc. It takes courage to listen to silence, but once you do consistently, you’ll find that all your questions are answered there. If you want to know how any relationship is going, listen to what is taking place in the silence. If you have the courage to confront the content of silence, you will become present to a whole new communication paradigm. If you need coaching or know someone who could benefit from honing these skills, feel free to contact me on my cell at (818) 486-3395 or by going to my web site. 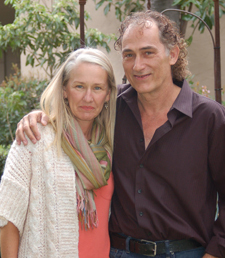 Copyright © 2009 Speakers & Artists International, Inc.
Eric and Amy Stone, also known as Eric and Amy Benichou-Stone are the Co-Founders of Speakers & Artists International, Inc.; a California Corporation. We are a husband and wife team dedicated to delivering world-class coaching and training programs in the arenas of business communication, public speaking, media appearances, performance, and personal growth & development. See bios here http://www.publicspeakingconnection.com/about.html Eric is also the Founder and Head Coach of Hollywood Actors Studio, in Beverly Hills, CA, where he has been developing talent, directing and training actors for the stage, film & television industries, and lecturing for more than 20 years. Amy is now the CEO of Speakers & Artists International, Inc. She's a multi-facetted and visionary guide and teacher. Her talent lies in her ability to focus on the individualís core identity and bring out truth and authenticity hidden behind the veil of ineffective habits and outdated conditioning. Eric Stone is also a Producer, a Creative Director, and a Professional Stage, Film, and Television Actor with major national and international credits to his name. Eric, also known as artist Philippe Benichou is a Published Author and an Internationally acclaimed award-winning visual Artist, represented in seven countries around the world. This entry was posted in Public Speaking Best Manners and tagged breathing, harmony, ideas, inflection, intonation, melody, message, Pausing, phrasing, pitch, rhythm, silence, sound, space and time, tone, verbal communication. Bookmark the permalink.